A part for the Long March 9 rocket was successfully developed in April 2015. China has developed the manufacturing techniques for a key part to be used on its super-heavy rocket that will fulfill the nation's manned missions to the moon. 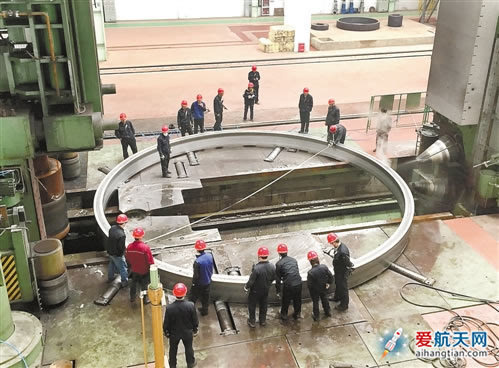 The China Academy of Launch Vehicle Technology, working with other Chinese institutes, has developed a super-large interstage ring to be used to connect stages of the rocket, tentatively called the Long March 9. The development was announced in a news release by China Aerospace Science and Technology Corp, the country's major space contractor. The release said an interstage ring is a key component in a multistage rocket, and that those used on China's current rockets were made in sections before being assembled. In contrast, the ring on the Long March 9 will be made through a casting method that produces it in one piece. The China Academy of Launch Vehicle Technology has begun preliminary research on the Long March 9. The work has been approved by the State Administration of Science, Technology and Industry for National Defense, which is in charge of the nation's space programs. According to sources at the academy, it plans to take up to five years to design and develop a liquid oxygen/kerosene engine with 460 metric tons of thrust and a oxygen/liquid hydrogen engine with 220 tons of thrust. The rocket will have a launch weight of 3,000 tons and is scheduled to make its maiden flight around 2030, the sources said, adding that it will play a key role in helping to land astronauts on the moon. "Rent me as your girlfriend!" 4"Rent me as your girlfriend!"